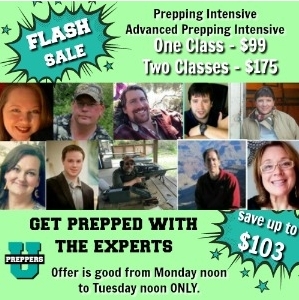 I just learned Prepper's University, started by uber-preppers Lisa Bedford (the SurvivalMom) and Daisy Luther (the Organic Prepper), is having a "flash sale" on sign-ups for the next series of courses. There are two courses: The eight-week Prepping Intensive and the six-week Advanced Intensive. The whole idea behind this gizmo is personalized preparedness guidance and accountability. Frankly it's an idea long overdue for those who need some assistance in getting their preps started. Students get immediate access to our Student Resource Center with hundreds of free, downloadable books, additional recorded webinars and classes, and printables. PREPPING INTENSIVE: This is 8 weeks long and includes 24 live webinars. All the basics of prepping are covered: water, sanitation, food storage, prepping for natural disasters, health and fitness for survival, creating a survival retreat no matter where you are, and prepping for longterm power outages. This course is the best bargain — students are paying less than $6 to have the chance to chat with experts and authors like Jim Cobb, foraging expert Merriwether, and Fernando Aguirre (FerFAL). ADVANCED INTENSIVE: This course is 6 weeks long and delves far more deeply into preparedness with topics that include setting up a bartering system, strategizing to earn extra money in order to exit the economy, surviving in a war-torn country, the realities of a survival homestead, and even moving out of the USA. We offered this course last session and it was overwhelmingly popular. It has a few different features, such as DIY projects aligned with each module’s topic, “You Are There” survival scenarios, and a few exclusive, recorded classes in addition to the webinars. However I was away from home most of the day and didn't find out about this flash sale until quite late, so I urge you to take a peek and see if this is something that might be of interest. Unfortunately the sale price ends Tuesday at noon so there isn't much time. I'm hoping if someone is an hour or two late in signing up, they're still able get the sale price. Just say the dorky woman from Rural Revolution couldn't get her act together and see if that works. Kind of expensive for my pocket. I was considering it, up until I saw that it was done over Facebook. I don't have an account, and never will. i just have to throw in my one and a half cents canadian (based on the exchange rate). when the whole prepping thing started years ago...i bought into the concept of people sharing their knowledge and experience for free. i did more free work for the american preppers network and the canadian preppers network than anyone knows about except for the people who also did it for free with me. now we have survival moms and survival universities and don't even get me started with how the american preppers network is making money - and we all promised it would NEVER be about money! i don't advertise on our blog where we share information for free. and i don't include links to blogs that advertise. prepping and the lifestyle were supposed to be about a lifestyle that was honest and free. prepping university? and you are one of the "experts". sorry. i just don't buy into any of that. people - save your money and find free blogs and free u-tube videos. nothing makes me more upset than people trying to cash in on making everyone else afraid. we don't need to be afraid - we need to be prepared. and for those of us not trying to make moola...we just share. again - my one and a half-cents canadian. God Bless You! You stated exactly what I feel also.. Thank You..